X-Men Unlimited (1993) #1 VF/NM 9.0 Marvel Comics,Storm; $4 Flat-Rate Shipping! X-MEN UNLIMITED # 1 June 1993. High grade VF/NM. X-Men Unlimited - Vol. 1, No. 1 - Marvel Comics Group - June 1993 - Buy It Now! X-Men Unlimited - Vol. 1, No. 2 - Marvel Comics Group - Sept. 1993 - Buy It Now! 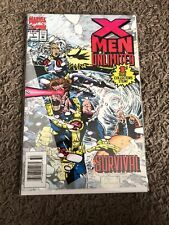 New ListingX-MEN : UNLIMITED #1 SURVIVAL GIANT-SIZE MARVEL 1993 NICE!! Marvel Comics June 1993 "X-Men Unlimited Issue #1"
X-MEN UNLIMITED #1 (1993) MARVEL COMICS GIANT-SIZE 1ST CHRIS BACHALO X-MEN ART! This page was last updated: 22-Apr 15:58. Number of bids and bid amounts may be slightly out of date. See each listing for international shipping options and costs.